Frances Gynn is an artist who is drawn to the traces of human presence in landscape and the natural world. It makes sense, then, that she should find inspiration in the garden of Little Dartmouth, the impressive creation of garden designer Dan Pearson. 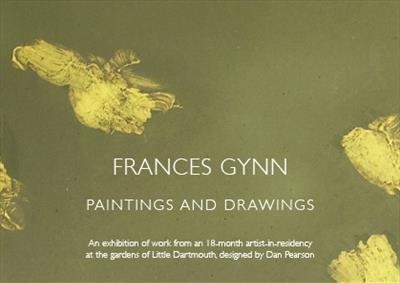 In an 18-month residency at Little Dartmouth, at the invitation of owners Edward and Sally Benthall, Gynn has engaged not only with the garden but with the sensibility of its maker, finding similarities and resonances with her own practice that have given rise to an extraordinary body of work. Gynn has always been interested in the effect of the elements and of nature on the textures of man-made objects. Her Beach Conversations series, developed over many years, examines the way materials found on the tideline are transformed by the actions of sea and shore, and paintings from the series were a centrepiece of her 2014 exhibition, Flow. By contrast, this exhibition focuses primarily on natural objects – the oldest trees at Little Dartmouth, towering spikes of acanthus in blinding white light, the glow of grasses in a patch of sunshine as winter draws near. The textures – tree bark, a petal of snake’s head fritillary, a mass of peach blossom – are natural ones. But behind the work is a shadowy human presence: what Gynn refers to as ‘the monastic figure of the gardener’ mapping the landscape, carving its bones, creating order out of the chaos of nature. Dan Pearson’s design is structured around a walled garden, but within and beyond that structure, he embraces wildness. In Spirit, his book about garden inspirations, he writes of the ‘fascinating tension... the delicate balance when the hand of man is still visible but when nature has the upper hand’. This tension is palpable in Gynn’s paintings and drawings. The blaze created by the sunlight in Winter Fire is bounded by the solidity of iron plant supports. A plant pot interrupts a burgeoning mass of green in the Chlorophyll paintings. A series of prints and drawings include gardening tools and implements. But it is in Stone Landscapes that she comes closest to a direct reference to Pearson’s vision, and in particular his placement of rocks and stone walls to create vistas looking out to the sea beyond Little Dartmouth. In these paintings she drapes delicate spidery meshes over boulders and the surrounding landscape – in part an allusion to the fishing nets of Beach Conversations, but also to the contour lines that map land and sea, effectively laying claim to space. drawings – especially Botanicals – and her paintings. She has spent hundreds of hours studying aspects of Little Dartmouth, in all sorts of weather, and has entire cabinets full ofsketches and photographs.Yet in her finished works she is never entirely representative. She is constantly at pains to blur detail, veil it in thin poured layers of paint, rub it out. Her exquisite drawing of an ash tree – one of the great trees of Little Dartmouth, along with oak and Monterey pine – is washed with rain; her reaching acanthus stalks flooded with thin brown oil that picks out the detail in the wet-on-wet marking of the petals. And her tendency is frequently towards minimalism – to see the bones of things. Gynn’s Forest prints, monotypes of single slender tree trunks, both pared back and incredibly detailed – reference the art of Japanese printmaking. She hangs them as an installation, a forest of papery verticals. Her tiny Peach Blossom oil paintings allude to the cherry blossom festivals of Japan, converting perfume into rose madder and white. And throughout her work, the urge to edit ‘back to the bare essentials’ is clear as flowers, birds and insects are reduced to a leaf, a single petal, a mark on canvas or paper. ‘Minimalism is something that can change your whole body as you view it – it gives you a kind of charge,’ she comments. Her Chlorophyll paintings immerse the viewer in a quasi-photosynthetic pigment, the layers of green ever more intense with the approach of summer. The experience is that of breathing in nature, inhaling chlorophyll directly into the lungs, reducing oneself to a Marvellian ‘green thought in a green shade’. The overall impression is of deep contemplation. Meditative though these paintings are, however, they are not wholly transcendent. A garden can never be perfect, never finished, never controlled. And in Gynn’s work, things break through, puncture the mood with bursts of activity and sudden frenetic passion. She is ever conscious of the teeming life at Little Dartmouth – of birds, bees and other insects, and their paths are rendered in staccato marks and explosions. ‘Big bee activity – the trickling down effect as bees fly from one flower head to the next, ’ she notes for her Acanthus paintings. In Winter Fire a blackbird scuttles away in a volley of marks. And in the Bird and Insect Flight series, she has captured the essence of their movements, their whooshes and flutterings, in single ink marks drawn with the point of a feather. Here Gynn has found a way to render not only motion but also sound – these works are loud with humming and buzzing and the beating of wings.